A portable player that does it all. Noel Keywood reviews FiiO’s affordable M9 that’s packed with ability. 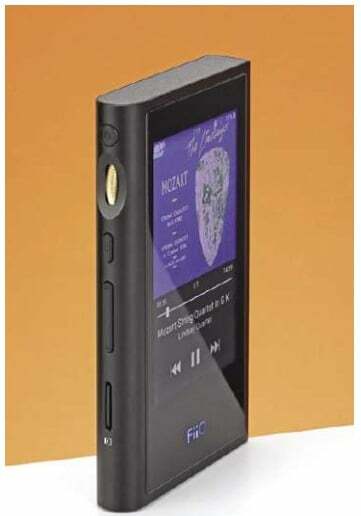 The FiiO M9 is a massively capable por­table player that in FiiO’s words “com­bines all of the functions people want”. Understandable to want it all – but inevitably this adds complexity where arrays of facilities must be selected from multiple menu layers by peering at tiny text on a small screen. I’m trying to get the M9 into context here. It has massive ability – even able to play DSD via DoP, making this a player that will perform even the most obscure functions – ones of appeal to audio enthusiasts. Size wise the M9 is pocketable at 60mm wide. 107mm high and 13.3mm deep, if a bit heavy for a shirt top pocket, weighing 139gms. 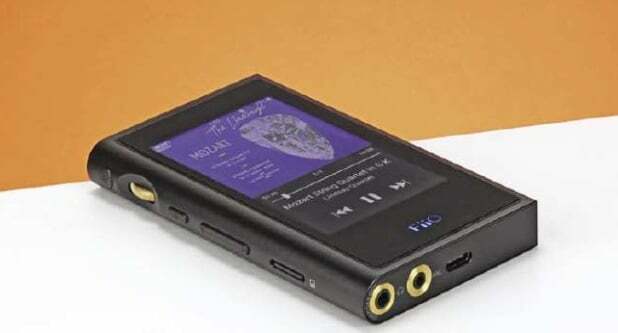 However, in spite of one swathe of complex circuitry inside that includes balanced headphone amplifiers and output, plus two new Asahi Kasei Microdevices (AKM, Japan) AK4490 DACs from the silky smooth sounding Verita Series, there is a long claimed 10hour life from the li-polymer 2350mAh re-chargeable internal batteries. Play hi-res and life will go down slightly, by the way – as usual. The unit charges from a USB 5V (2A) supply / USB computer output as usual, charge time 2hrs. FiiO claim fast performance from the Samsung Exynos 7270 CPU running a customised Android operating system but start-up was slow at 40 seconds, touch-screen response was tardy due to very small and insensitive active areas, whilst numerous swipes to transit from Home to Play also slowed things down. I had to be patient to get through all the many menus, especially the numerous Settings menus flagged by the same gearwheel icon but different in content. With Android you must load music files into a Music folder using an Android loader window that appears automatically on a Mac, but it is seen natively on a PC. However, this player uses a USB Type C socket and USB 2.0 that my USB2 Mac hub was sniffy about; I had to plug in direct for a stable link, so data rate appears to be high. No problem here with the PC though. There’s a nice, if slow, edge- style volume control wheel with big on-screen colour readout (0-120), Play/Pause and Track Skip buttons plus a card slot to expand the on­board 2GB of storage (1000 CD tracks / 20 DSD tracks) to up to ITB. The real use of a card slot is, I find, to carry a small curated collection around. Note that DSD tracks are vast at around 100MB so demand a large capacity card. In addition to both unbalanced (3.5mm jack) and balanced (2.5mm jack) headphone outputs the M9 can also transmit music to a hi-fi or ‘phones via Bluetooth, using aptX and aptX HD codecs, as well as LDAC (Sony ’phones) and HWA formats (SBC and LHDC). Standard aptX is pretty dam good, applying little compression (5:1) and giving about 98dB dynamic range so no need to get too worried about all this. There’s wi-fi for downloading files from a PC or for playing them via DLNA when Windows Media Server has it activated (Windows 10). Macs don’t have DLNA as standard but it can loaded as paid/free option. The M9 found my PC without trouble, with an amusing message ‘I Servers Founded’ and played music files without problem. There’s streaming from the ‘net via pre-installed Tidal. NetEase Music, KKBox and Moov installed, with Qobuz, Spotify and other services compatible options. Although Chinese players can rarely be software updated from Mac (due to hidden desktop files), when set to act as a USB DAC my Mac saw the M9 immediately. However, FiiO’s USB DAC graphic said ’48KHz 24bits’ no matter what output sample rate was set in the Mac and appears a static graphic, not a genuine sample rate readout. All the same, the M9 worked all the way up to 192kHz sample rate. The player accepts DoP over USB in order to read DSD files played on a computer, but with Mac you need a paid-for Audirvana + for this. PCs just need a suitable Steinberg based driver. DSD files loaded into the player’s memory played perfectly I found, in Iso, dsf and dff file format, up to DSD 128 (double rate DSD). Good news is inclusion of an S/PDIF digital output (electrical, not optical) through the 3.5mm headphone jack using a short adaptor lead (supplied), so a high quality external hi-fi DAC can be used, allowing me to hook up a mains powered Audiolab M-DAC+. The adaptor plug is a 4 pole 3.5mm – rare – and an ordinary 3-pole 3.5mm adaptor doesn’t work properly here. The player will run from external power whilst playing so it can be used as a transport in effect. The same 3.5mm socket can be switched to Line Out also, that cuts out the volume control and sets analogue output to 2V – the same as a CD player, so the M9 can act as a CD player, one able to additionally play hi-res and DSD. The headphone outputs – 3.5mm and 2.5mm jacks – sit on the bot-tom face, with symmetrical USB C connector alongside. The M9 has a gold-hue rotary volume con­trol, transport buttons and micro-SD card slot on its left face. At top sits the on/off switch. 2.5mm plug that I find snaps too easily to be practicable for use on the move. The player arrived with 1.0.0 software. I updated over wi-fi to latest 1.0.2 (two successive downloads) via the ‘net without problem but a ‘TF card’ is requested and must be inserted (SD card). I had no luck trying to understand FiiOs instructions on loading a zip file to the player direct, tried a few common methods (load zip to root etc) but none worked. This left a USB DAC driver update V4.47.0 unloaded, as no loading instructions accompany it. The M9 had the speed and sound balance I heard from the M7, even though they use different DACs. Selecting Fleetwood Mac’s Dreams (24/96 WAV) the sound sped off the mark with vivid pace and strong cymbal crashes from Mick Fleetwood’s drum kit, even though I used Slow filter. His drums had firm impact too. It was an immediately impressive sound, if not as subtle and silky as I know AKM’s Verita Series from mains powered DACs. The player has strong insight and it nicely sorted tracks like Tom Petty’s Refugee (24/96 FLAC) that can come over as muddled and harsh through some players. Similarly with The Eagles Somebody, a horribly upward compressed CD track – but it came out well here, again with grippy sense of pace from the energetic bass line. Glen Frey’s vocals clear centre stage whilst Hammond organ swirled menacingly left and right. The Audiolab M-DAC+ got more depth out of this track but the M9 made it exciting. When lowering pace to the softer and slower Narrow Daylight from Diana Krall (24/96) the M9 player imposed hard outline on images and added firm grip to the slow plucked bass line. Swapping over to our Audiolab M-DAC+ gave an easier, more laconic presentation, the one I am used to from this track in my review suite on SD card; there was a greater smoothness and depth too. However, I then loaded a DSD version (correctly flagged as 2822kHz meaning single rate DSD at 2.8MHz) and heard an easier and more open rendition with plucked bass sounding fulsome rather than ‘fast’. This was really impressive, moving quality right up. Double rate DSD (5.6MHz) was also played without problem. DSD came over as more open and natural than PCM but the files are huge at 100s of MBs. 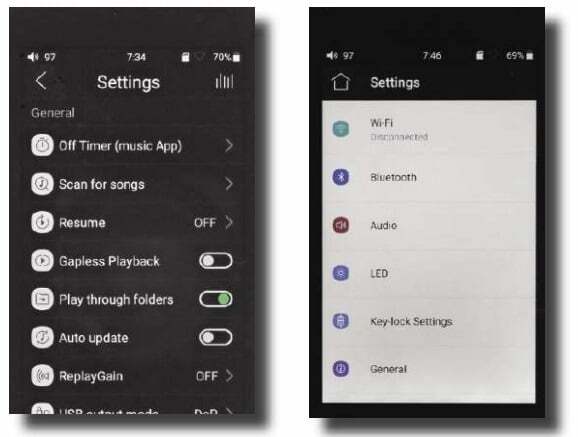 There are two – different – settings menus and both carry audio functions. Confusing. Orchestra and Mahler’s Symphony No8 ‘Veni Creator Spiritus’ (24/96 FLAC) the choirs stretched wide and individual sections, such as male counterpoints, could be easily picked out. As with Rock I found the M9 able to avoid muddle, even with volume right up. There was more air and space with a DSD recording of The Trondheim Soloists playing Divertimenti, strings texturally rich yet free from harshness. FiiO’s M9 is a complex and capable player. It’s ability to stream from on-line music services will be a key feature for many I suspect. Add in Bluetooth headphone connection and USB DAC capability and the M9 looks very attractive. It has a fast, punchy sound that will appeal to many – but at the expense of space and subtlety. So very good, if not an ultimate audiophile machine, except with DSD. Frequency response of the M9 reached 50kHz (-1dB) before rolling off slowly to the upper theoretical limit of 96kHz, our analysis shows, with a 24/192 digital PCM signal and both Sharp Roll-Off filters (2). The Slow Roll-Off filters (2) reduced this to 40kHz – little change. 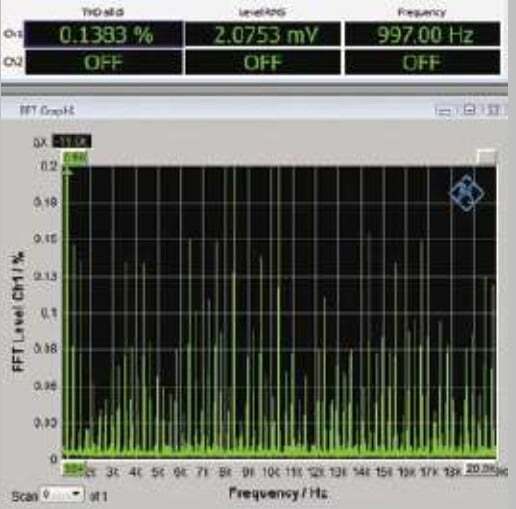 With CD the figures were 21kHz and 12kHz respec­tively, Slow Roll-Off softening treble perceptibly by a small amount. Distortion was on the high side at 0.13% (-60dB, 24bit) where 0.03% or less is common, our analysis showing an array of harmonics. This resulted in an EIAJ dynamic range value of 104dB – low by current standards where 115dB is common and 117dB quoted, as expected from AKM4490 DACs. We tested two samples, both running latest firmware (1.0.2). The problem was digital noise (wi-fi and Bluetooth set to Off), since S/PDIF out gave the same result via an Audiolab M-DAC+. Running the same test files (on SD card) through our Astell&Kern AK120 gave 0.03% distortion and 117dB dynamic range. 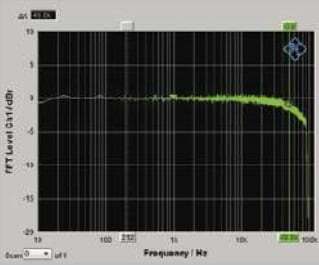 With CD distortion measured 0.18% which, as CD goes, is very good, dynamic range being 101dB – little worse than hi­res. The M9 is fine with CD, less so with hi-res. There appears to a problem here, similar to an M7 tested August 2018 issue. Output measured 2.4V from the 3.5mm headphone jack (unbalanced) – enough to drive all headphones, rising to 2.7V from the 2.5mm jack (balanced). Line output delivered 2V – the same as a CD player – with the same dynamic range and distortion values as Headphone out. FiiO quote the 3.5mm unbalanced output in terms of power – 125mW into a low 16 Ohms (most headphones are either 40 Ohms or 300 Ohms) – the M9 just managed this. Into 40 Ohms it delivered full output (2.4V / 144mW). The M9 has limited dynamic range with hi-res files, like the M7 tested previously, even though different DACs are used. Otherwise, it worked well. An affordable player with “everything' on-board, including streaming. Exciting sound, but not svelte.